So back in September we conducted a survey of voters about what mattered to them. We received 141 responses. Admittedly, we hoped for more, but they revealed some interesting things. 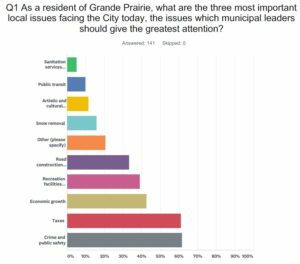 Asked what the three most important local issues were, crime and public safety and taxes were key for 60% of people. Economic growth was third but followed closely by recreation facilities and road construction. We were a bit surprised by the crime and public safety numbers, but it clearly has persisted as a concern for people. In terms of how the quality of life has changed, a plurality felt it had improved but more than a fifth of people believe things have gotten worse in the past four years. Those who commented as to why they felt it had decreased cited the rising cost of living, concerns over crime and particularly drug use. Snow removal and road construction were also noted as problems. We asked if respondents had a particular question they’d like to ask the candidates and there were fifty suggestions. They covered a wide range of topics and did help shape our questions to the candidates.